IG GENERATION AND DISSIPATION MECHANISMS IG MODELLING TECHNIQUES INWAVE a. EQUATIONS AND NUMERICAL SCHEME b. HOW IS IT LINKED TO THE VORTEX FORCE? c. APPLICATIONS d. FUTURE PLANS Although the Inwave driver is still being tested, I will explain you why we decided to include this new driver in COAWST. 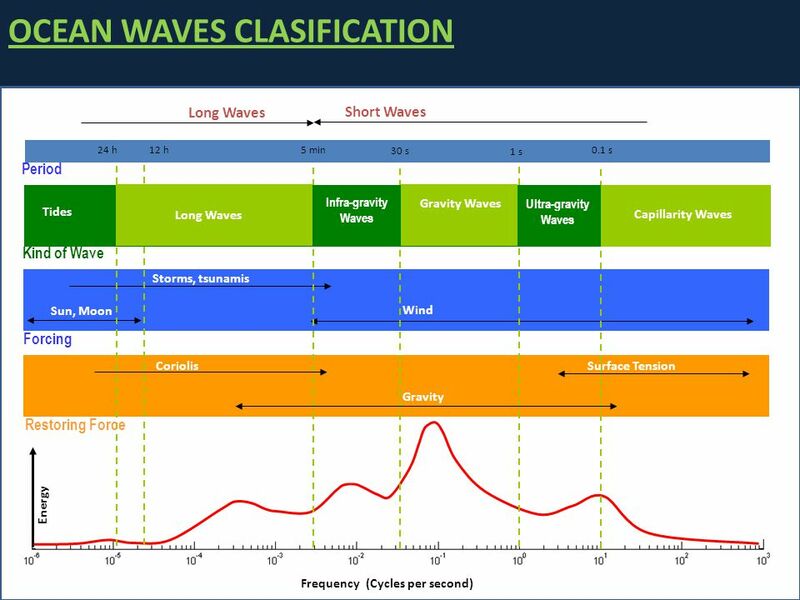 For those how are not that familiar with what Infragravity waves are, I will explain the generation and dissipation of this long waves and I will briefly mention which are the implications of the existence of these waves in coastal areas. I will also describe which numerical techniques can we use to model these kind of waves, their advantages and disadvantages. I will describe how Inwave works, I will show some applications and tests of Inwave. Finally I will point out which is the current situation of Inwave and which are our future plans. - They are generated by incoming wave groups. - Account for 20-60% of the offshore energy. - These long waves reflect from the shore to form cross-shore standing pattern (= minimal dissipation at shoreline). - They can propagate alongshore (edge waves), sometimes forming standing pattern. - Can significantly contribute to the surfzone circulation. The main characteristic of these waves is that they are created by incoming wind wave groups. 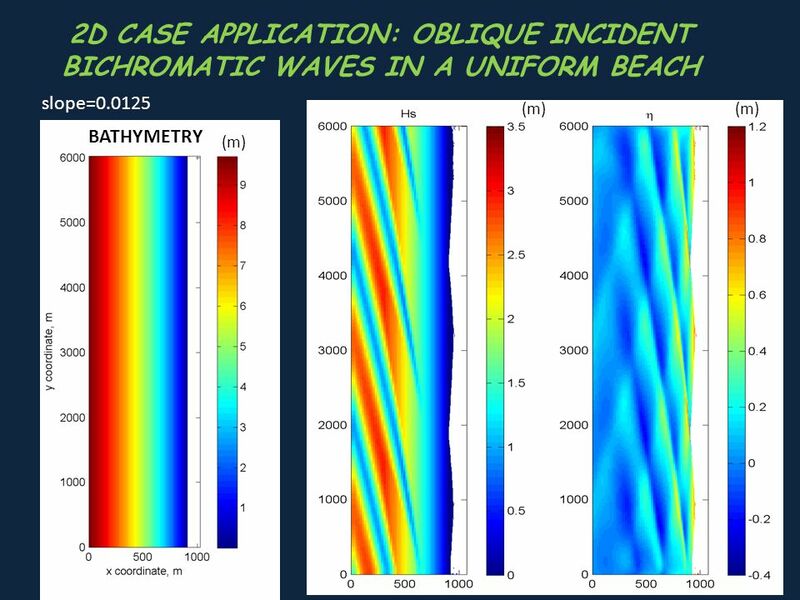 As they propagate onshore, their energy increases and they can dominate the water motion on dissipative beaches These waves reflect on the shore to form cross-shore standing pattern And they can also propagate alongshore to form standing wave patterns. 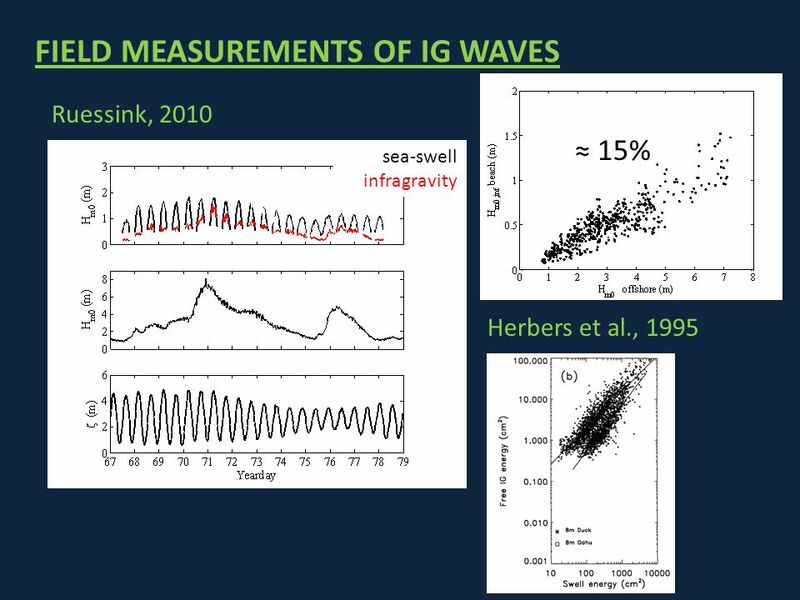 Ruessink, 2010 ≈ 15% sea-swell infragravity Herbers et al., 1995 As shown by different field measurements, the IG wave energy in the nearshore depends on the offshore wave energy. These are the data collected by Ruessink 2010 in Truc Vert Beach (France). In this first graph, we can see the time variation of the water level and the offshore wave height. There was a strong storm event in the measurements. 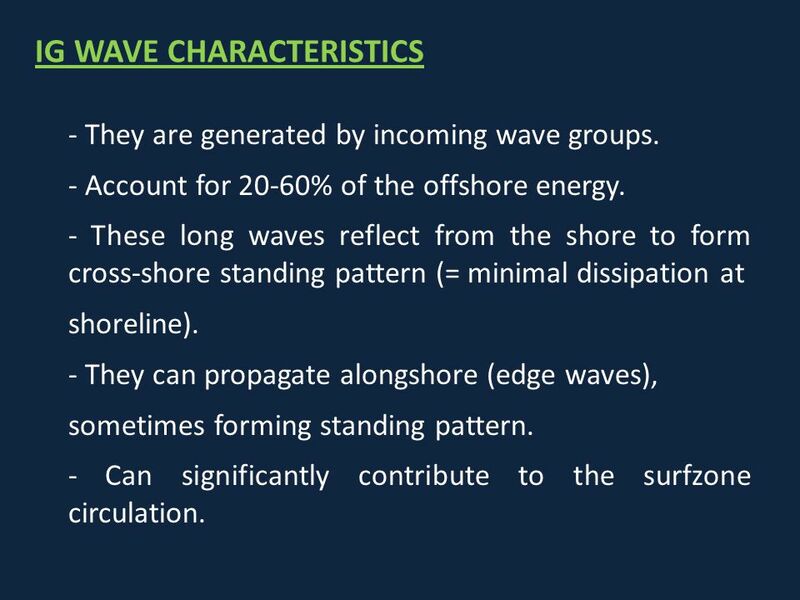 What we can see is that offshore wave energy in dissipated in the beach, we can see how the wave energy is water limited and the consequence is this short wave height modulation. We can also see the existence of the IG wave band in the surf zone. 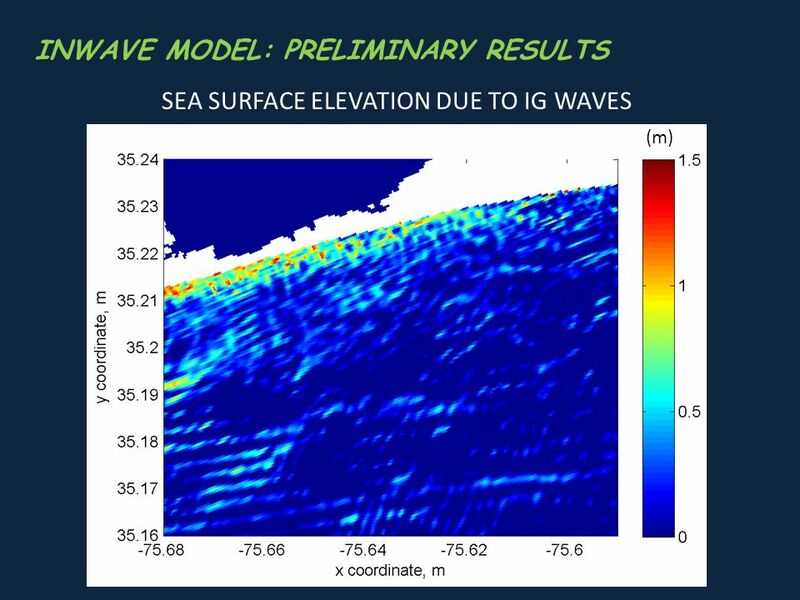 We can see how the IG wave height is also tidally modulated and how it increases when the offshore wave energy is higher. Ruessink, found that in this beach around 15% of the offshore wave height is in general transferred to the IG motion. 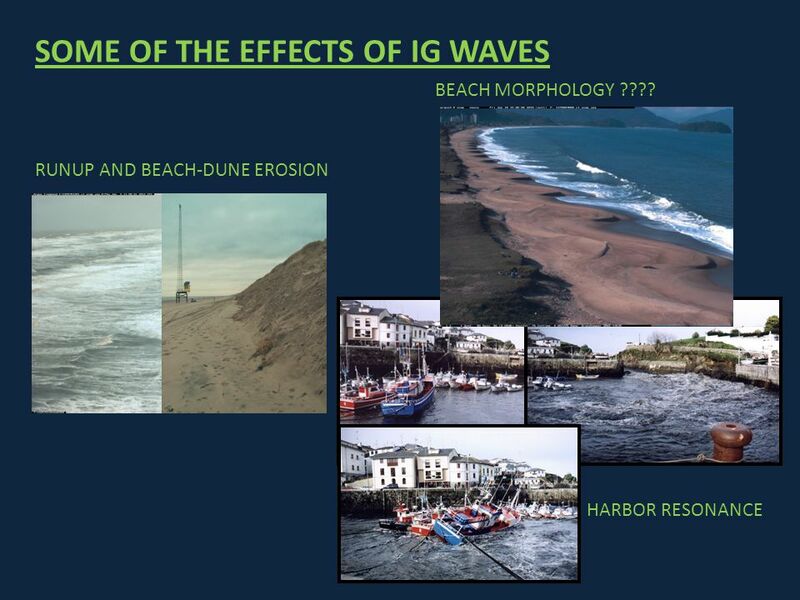 But this relation between the offshore wave energy and the IG wave energy has also been detected in other beaches such as in Duck and Oahu and in lost of places around the world. 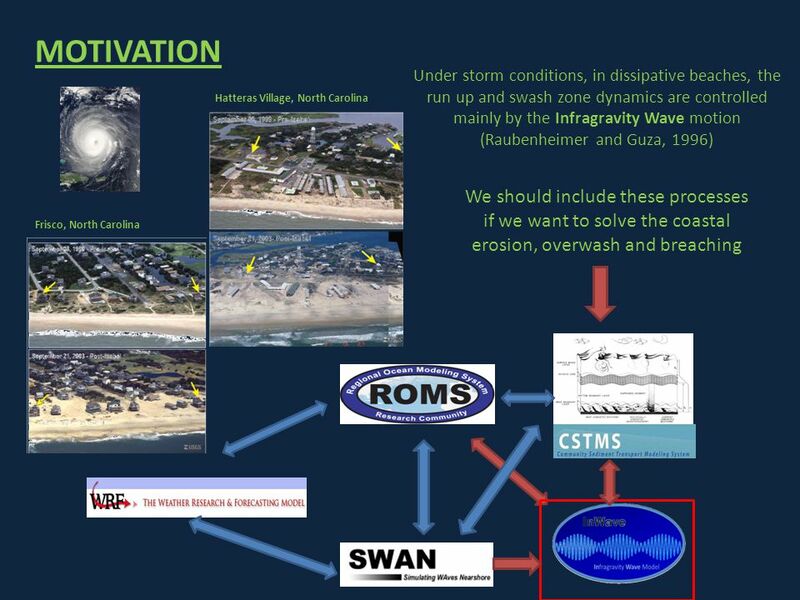 7 MOTIVATION Under storm conditions, in dissipative beaches, the run up and swash zone dynamics are controlled mainly by the Infragravity Wave motion (Raubenheimer and Guza, 1996) Hatteras Village, North Carolina We should include these processes if we want to solve the coastal erosion, overwash and breaching Frisco, North Carolina Our main goal of including the IG generation processes in COAWST was the improvement of the flooding and erosion simulation during storm conditions. As I mentioned earlier, under storm conditions, in dissipative beaches the runup and swash dynamics are controlled mainly by the infragravity wave band. 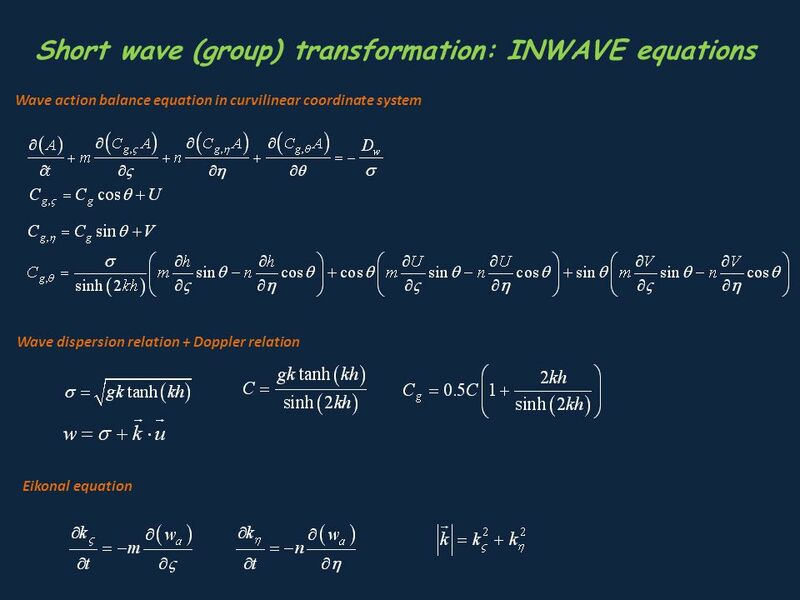 The short wave energy in the surf zone gets saturated and the energy is transferred to the IG wave motion. For this reason, if we want to simulate the coastal erosion, overtopping and breaching we should include these processes in the COAWST modeling system. At this moment the wave driver in COAWST is SWAN. SWAN is designed to work in a time scale in which all wave groupiness processes are averaged. For this reason it is not designed to include the wind wave energy modulation and therefore the IG wave generation. For this reason we decided to include a new wave driver (Inwave) that considered the possible wave groupies. 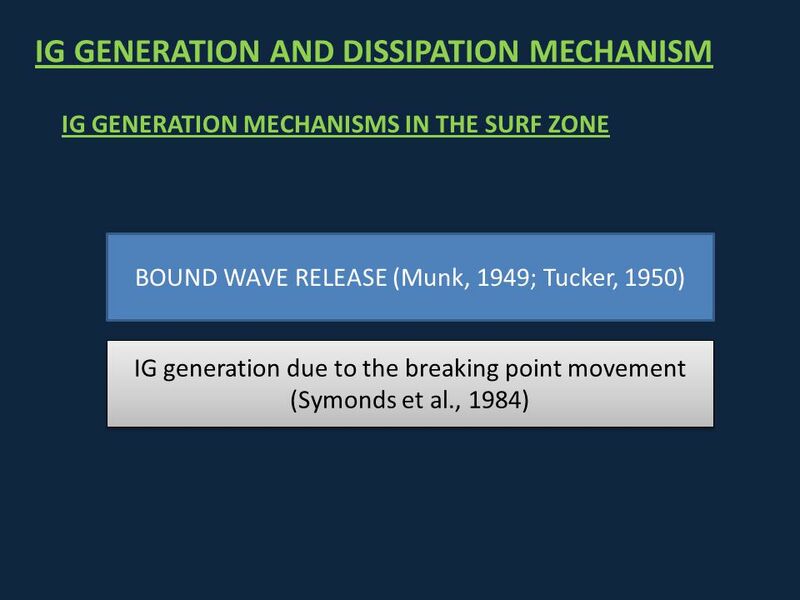 IG GENERATION AND DISSIPATION MECHANISM IG GENERATION MECHANISMS IN THE SURF ZONE BOUND WAVE RELEASE (Munk, 1949; Tucker, 1950) IG generation due to the breaking point movement (Symonds et al., 1984) Before I start to talk about Inwave, I think it is important to mention which are the possible Infragravity wave generation and dissipation mechanisms. 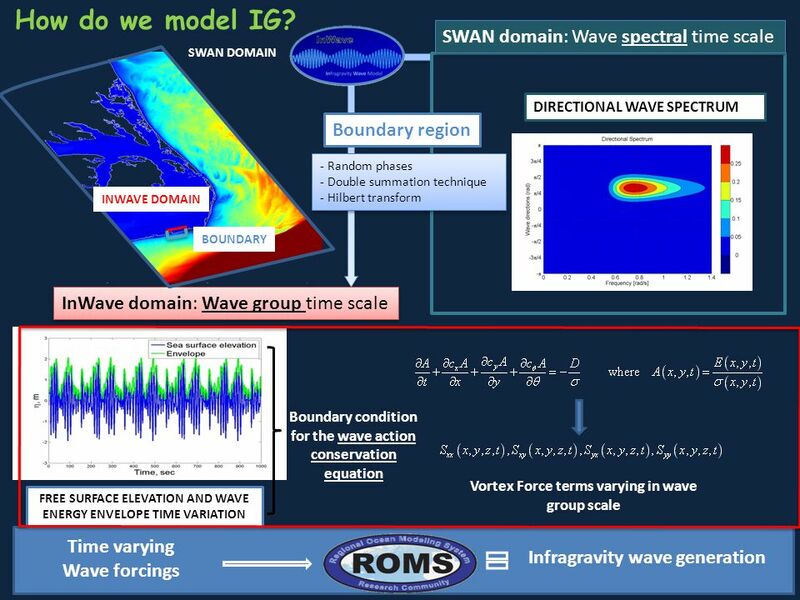 Basically InfraGravity waves can be generated by two mechanisms: The bound wave generation and its release in the surf zone. The breaking point movement in the surf zone that acts like a paddle for long Infragravity waves. Radiation stress gradient Pressure gradient In the offshore, wave groupiness, due to variations on the radiation stress gradients creates a bounded long wave, that travels with the group velocity. 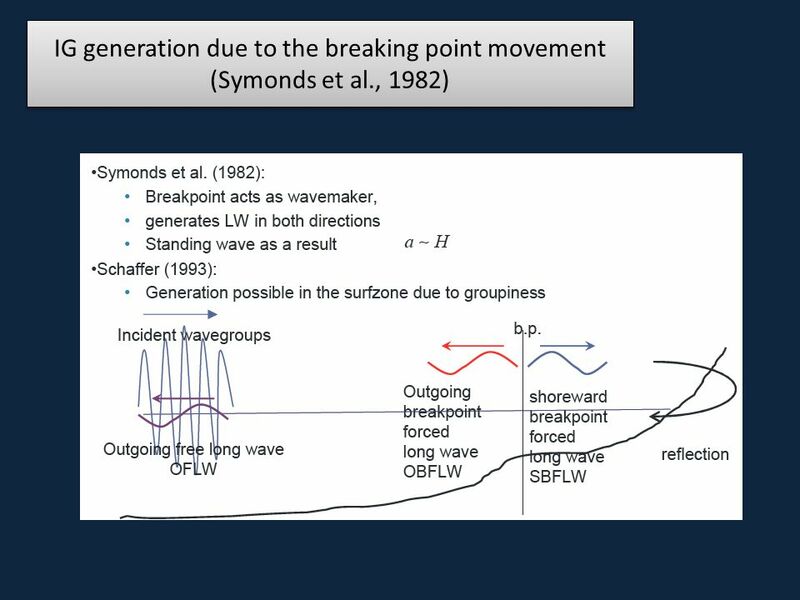 As the wave group propagated towards the shore, this bounded wave shoals and when the wave group is destroyed the bound wave get released and starts to propagate as a free long wave. This free long wave can be reflected in the shore or in the breaking point, producing an outgoing free long wave. The other IG wave generation mechanism is the breaking point movement. Within a wave group, the highest waves will break more offshore and shorter waves more onshore. This creates a variation on the extension of the surf zone, within a wave group. This variation acts like a wave maker creating an onshore directed free long wave and an offshore directed break point forced long wave. regime (Battjes, 2004) The dominance of this generation mechanims depends on the slope regime defined by Battjes in 2004. 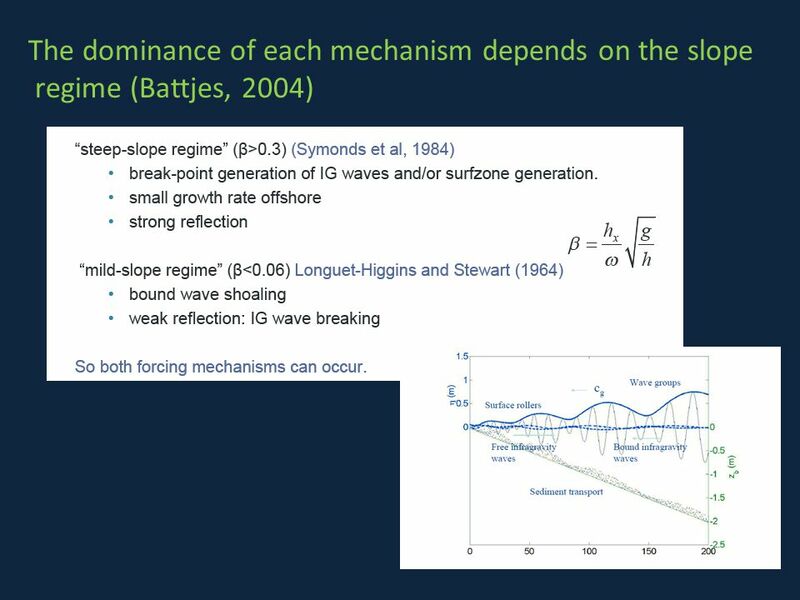 The slope regime depends on the beach slope, the wave frequency, the water depth and the gravitational acceleration, For steep slope regimens the breakpoint variation mechanism seems to be more important, while in mild slope regimes the bound wave release is more relevant. 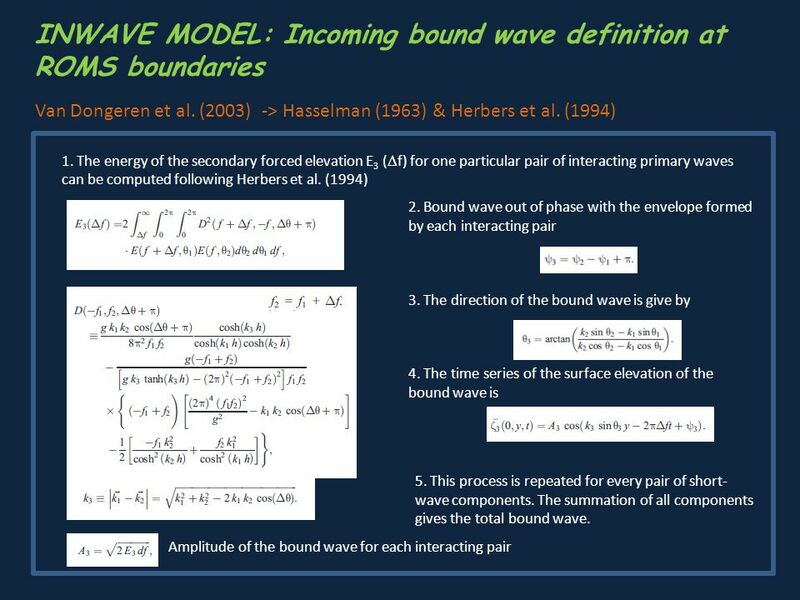 Anyway, both mechanisms can occur and we should consider both when modeling IG waves. trapped in the coast due to refraction as edge waves or be reflected offshore as leaky waves In 2 dimensions the problem is even more complex. 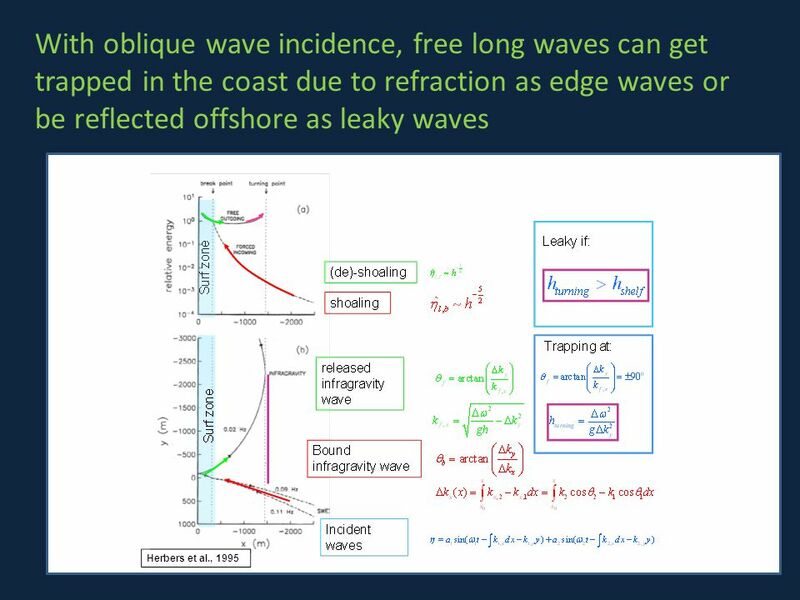 With oblique wave incidence or high directional spreading, the free IG waves in the surf zone can be trapped due to refraction propagation as edge waves or they can be reflected propagation offshore as leaky waves. Bottom friction. IG wave breaking. Energy transfer thru non-linear interactions to lower periods. It is not clear which is the main dissipation mechanism and it might depend on the beach slope and on the frequency of the IG components. 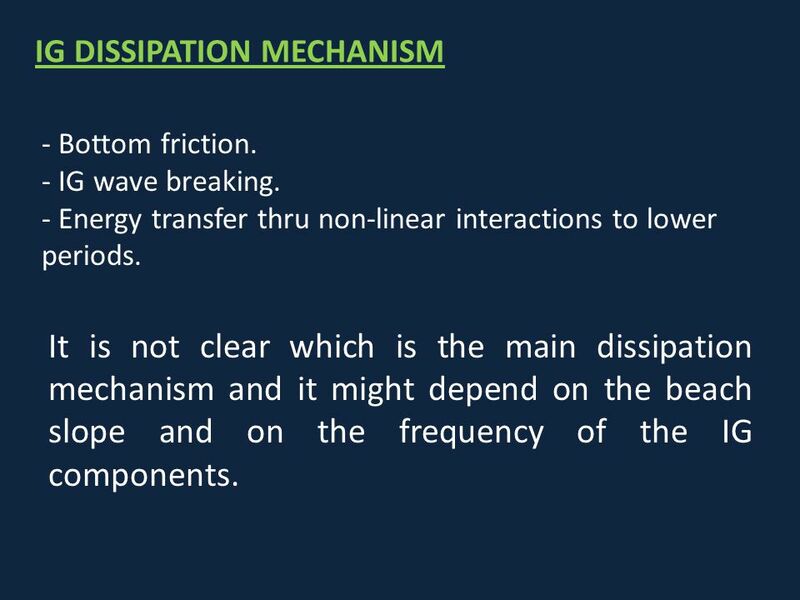 Bottom friction, IG wave breaking and non linear energy transfers are the main mechanisms of IG wave dissipation. However, it is still not clear which is the relative importance of each process and more reach is needed in this direction. 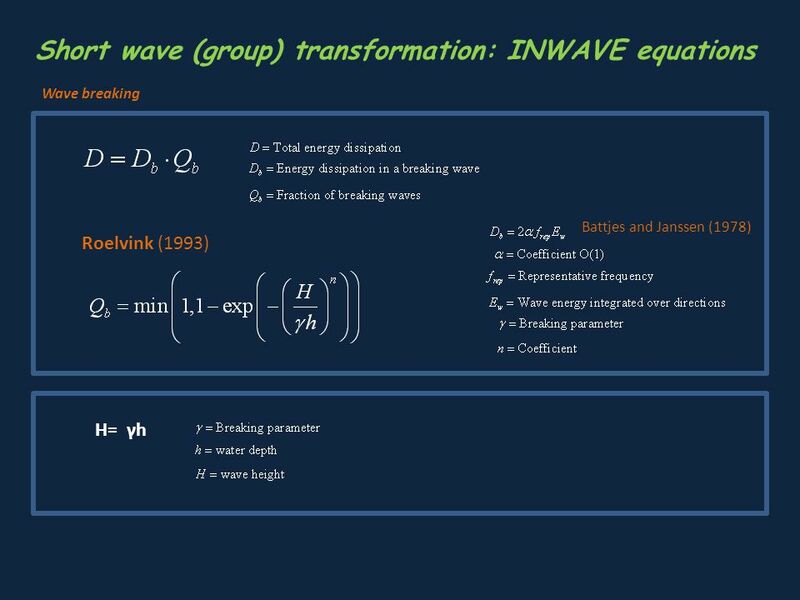 In summary, we want with inwave is to create a wave driver able to create the forcing to simulate all this processes. 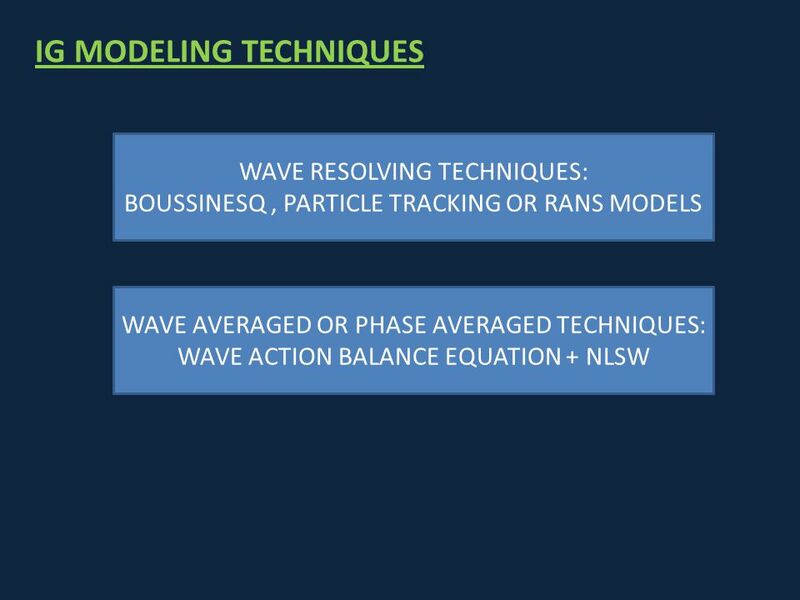 WAVE RESOLVING TECHNIQUES: BOUSSINESQ , PARTICLE TRACKING OR RANS MODELS WAVE AVERAGED OR PHASE AVERAGED TECHNIQUES: WAVE ACTION BALANCE EQUATION + NLSW With respect to the IG wave modeling techniques I would say that there are 2 main types of models: The first type are the wave resolving models, such as the bousinnesq, RANS and particle tracking models. 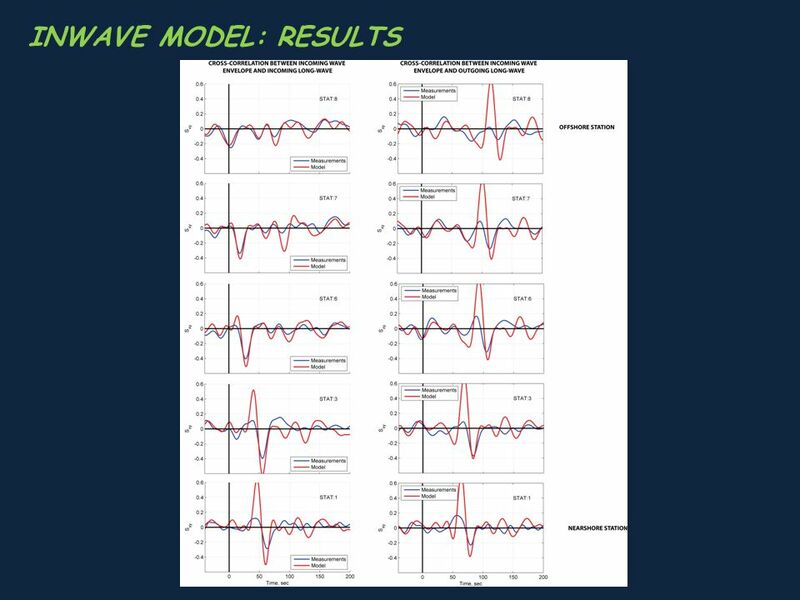 The advatage of these models is that they consider the long wave- short wave non linear interactions and that the wave nonlinearities are implicitly included in the models. The main problem of these models is that they are computationally expensive, especially the RANS and particle tracking models. The use of boussinesq models would be an option, but the problem is that these are vertically averaged so we would not be able to simulate 3D processes such as undertows, that in the surfzone are important. 2. 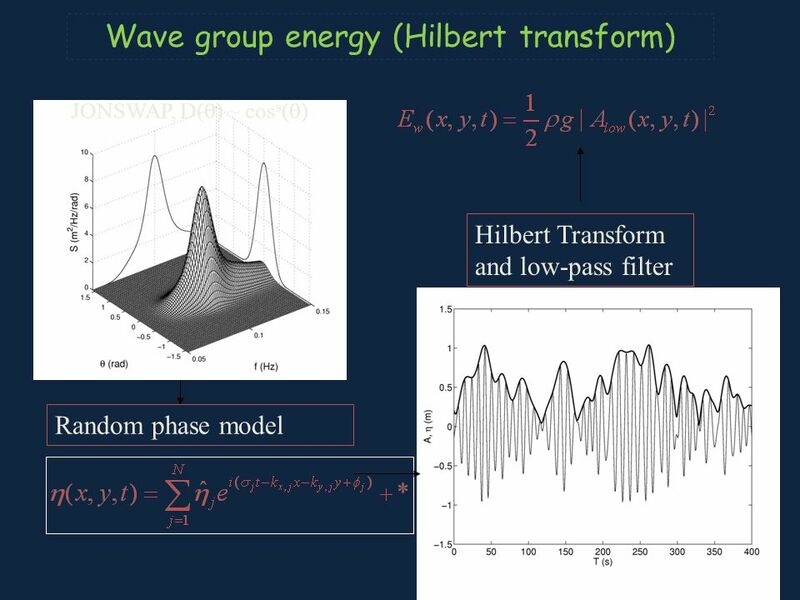 The second type of models are the phase averaged wave models coupled to the NLSW equations. These are computationally less expensive but they have more physical limitations. For example the effect of short wave non linearities are not consider. 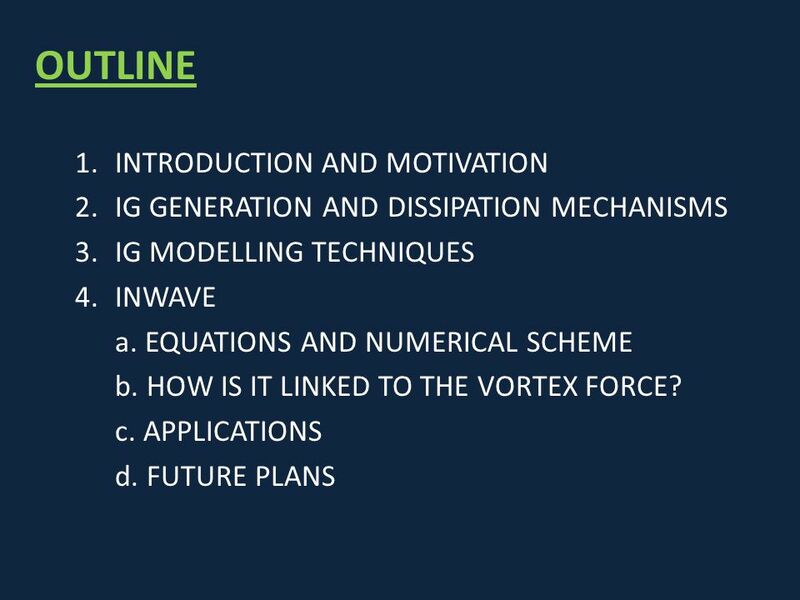 This is a summary of the IG wave model references, indicating if they are 1, 2 or 3 dimensional models and which types of equations the solve. 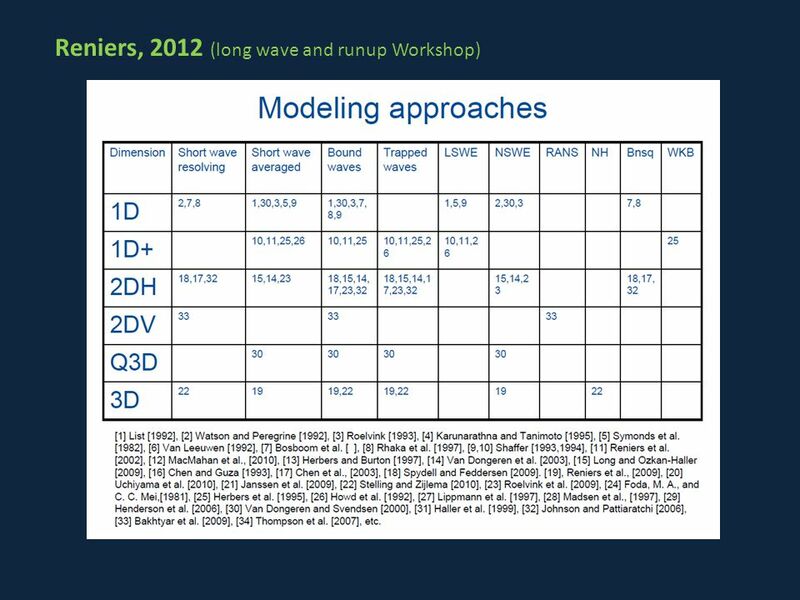 This was presented by Reniers in the Long Wave Run Up workshop 2012. 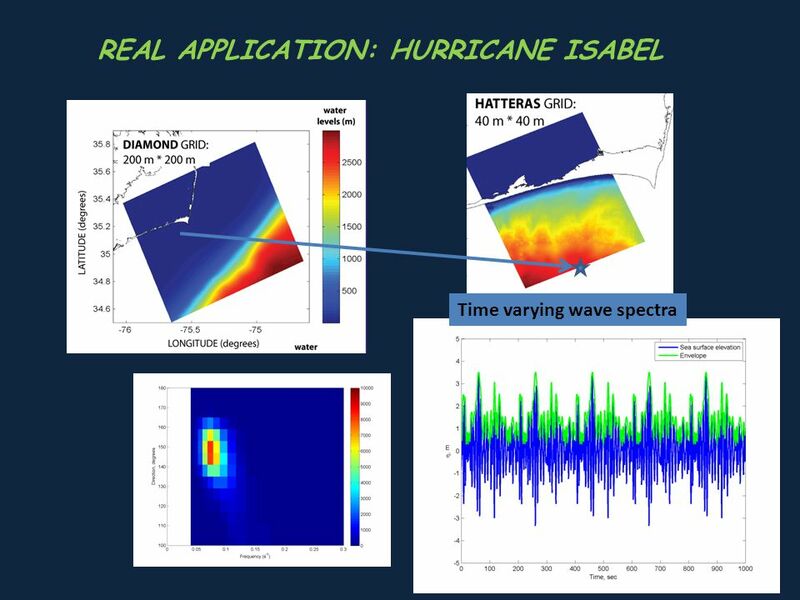 What we can see is that there are very few 3D models that include IG waves, the one presented by Reniers in 2009 (which is based on xbeach coupled to Delft 3D) and the model presented by Steeling and Zilejma (2010) which is the swash model. 28 FUTURE PLANS Validate Inwave with more test cases. 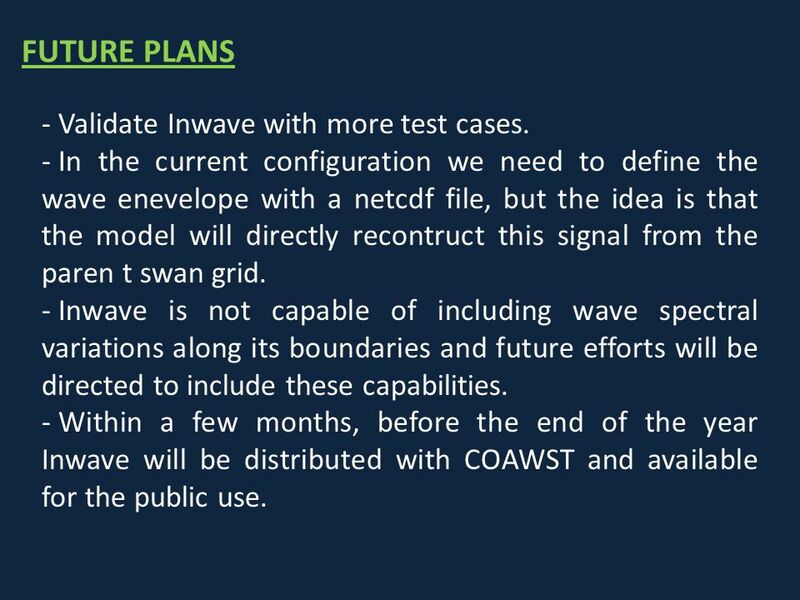 In the current configuration we need to define the wave enevelope with a netcdf file, but the idea is that the model will directly recontruct this signal from the paren t swan grid. 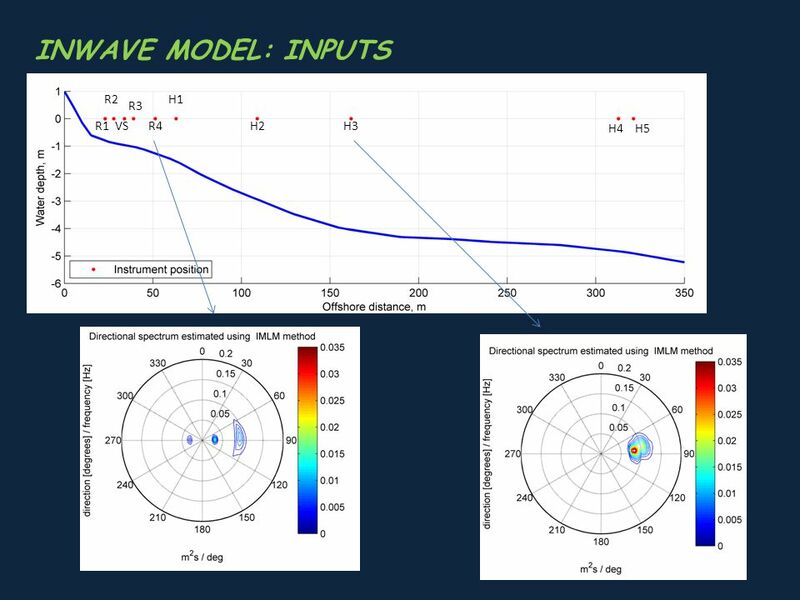 Inwave is not capable of including wave spectral variations along its boundaries and future efforts will be directed to include these capabilities. Within a few months, before the end of the year Inwave will be distributed with COAWST and available for the public use. 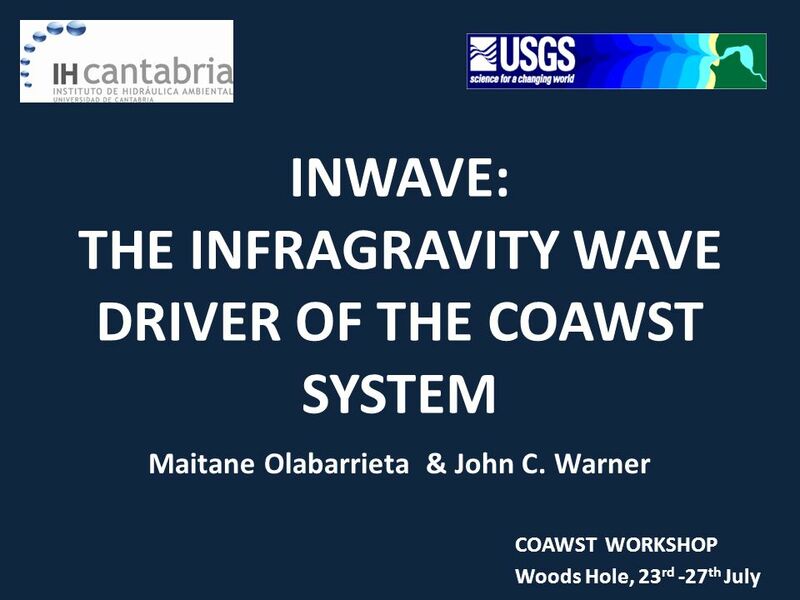 Download ppt "INWAVE: THE INFRAGRAVITY WAVE DRIVER OF THE COAWST SYSTEM"
The Wave Model ECMWF, Reading, UK. Wave Dominated Coasts Objective: to examine some of the processes and characteristics active on a wave-dominated coast. Transformation of Shallow-Water Waves The Certificate Program in Tsunami Science and Preparedness. Held at the University of Washington in Seattle, Washington. Operational Forecasting Wave Models. WaveWatch III (Tolman 1997, 1999a) Model description: – Third generation wave model developed at NOAA/NCEP. – Solves. 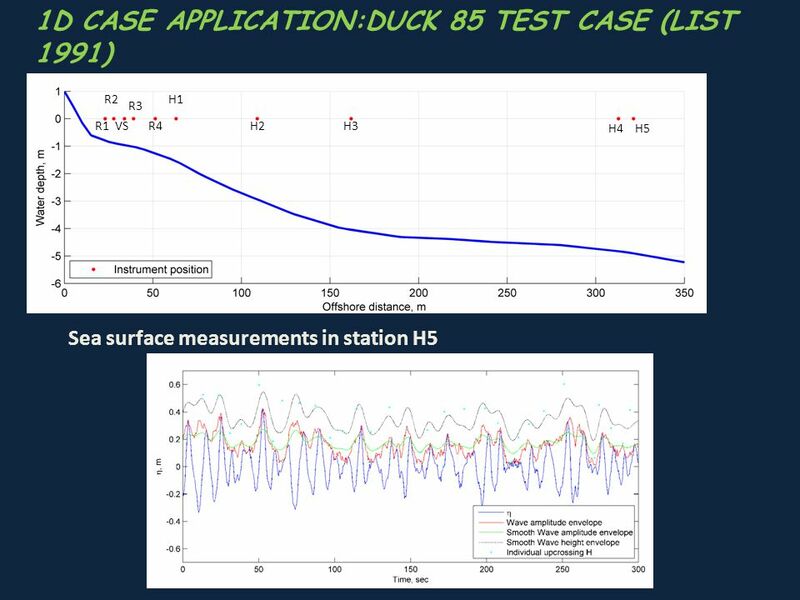 EAGE Dubai 12/11/ Interpretation of hydrocarbon microtremors as pore fluid oscillations driven by ambient seismic noise Marcel. 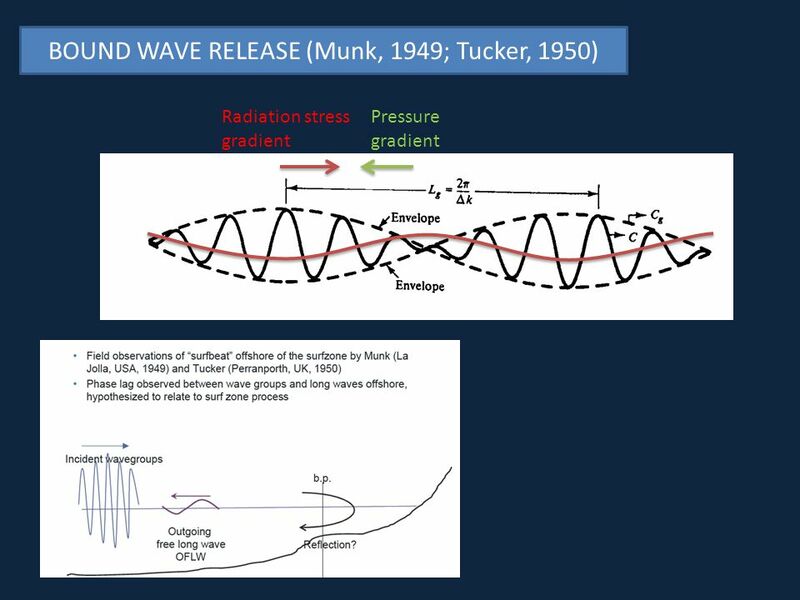 Chapter 9: Waves and Water Dynamics Fig Waves are moving energy Forces cause waves to move along air/water or within water Wind (most surface ocean. Geog 3A ~ Final Review Chapter 10 ~ Ocean Waves Chapter 11 ~ Tides. 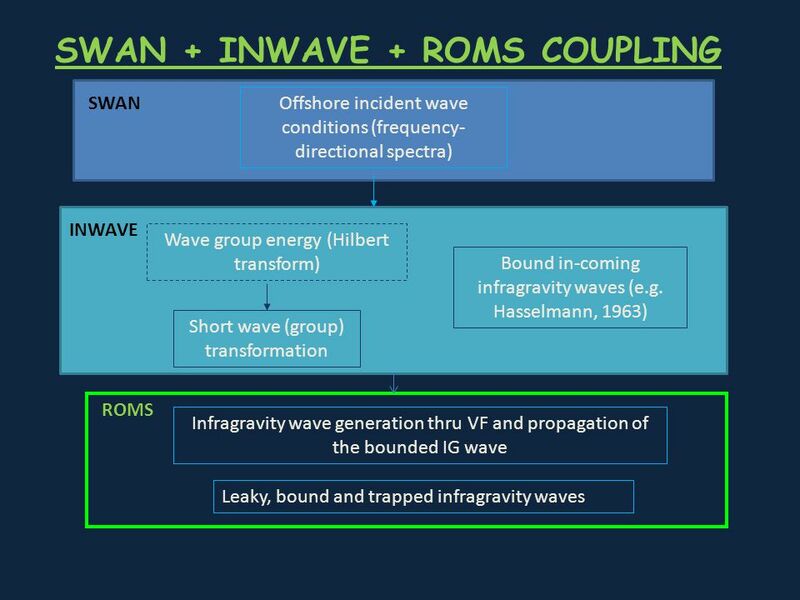 The role of resonant wave interactions in the evolution of extreme wave events R. Gibson and C. Swan Imperial College London. International Symposium on Sediment Transport and Sedimentation on Asian Continental Margins Measurement of Infragravity Edge Waves on the East Coast of. Surface Gravity Waves-1 Knauss (1997), chapter-9, p Descriptive view (wave characteristics) Balance of forces, wave equation Dispersion relation. Key factors determining the extent of tsunami inundation – Investigations using ANUGA Biljana Lukovic and William Power GNS Science, Lower Hutt, New Zealand. WORKING GROUP 1 MODELING OF WIND WAVES AND SURGE EVENTS IN THE CASPIAN, BLACK, AZOV AND BALTIC SEAS.